In Surabaya, the development of residential experience a very significant change. Starting from the architecture to the materials and technology used. One is the roof, is a cover over a building that protects the inside of the building from rain or heat. 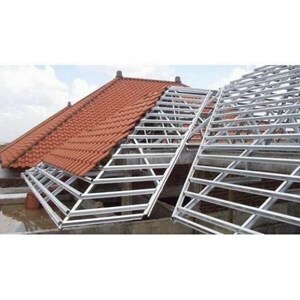 The type of roof that is currently favored is mild steel. Light Steel Surabaya and surrounding areas have used this type of light and thin, but its strength is not less than conventional steel. Lightweight steel construction has been tested through research conducted by experts for years and has passed the strength test and passed testing related to human safety. The advantages of using lightweight steel material rather than wood materials are often disturbed termites and weathered so require care and even a comprehensive replacement at a certain time.